Los Angeles Clippers owner Donald Sterling attends the NBA playoff game between the Clippers and the Golden State Warriors on April 21, 2014, at Staples Center in Los Angeles. To pave the way for a sale of the Los Angeles Clippers without NBA intervention, Donald Sterling reportedly offered to step aside to allow his wife to broker the sale of the team, according to CNN. But the NBA rebuffed the offer, CNN says. The couple co-owns the team through trust, with Donald Sterling as the controlling owner and his wife as the non-controlling owner. "We continue to follow the process set forth in the NBA Constitution regarding termination of the current ownership interests in the Los Angeles Clippers and are proceeding toward a hearing on this matter on June 3," NBA spokesman Mike Bass said, CNN reports. Lawyers for the Sterlings, who earlier declined to comment about the couple's effort for a voluntary sale, did not respond to Bass' statement, the report says. The Clippers declined to comment on the NBA statements, spokesman Seth Burton said, according to the news site. 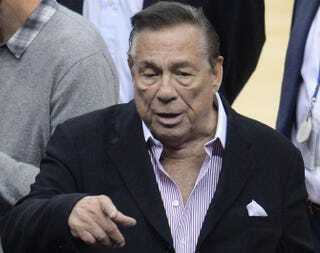 The NBA argues that its reputation was damaged when an audio recording of Donald Sterling, 81, making anti-black remarks generated widespread outrage.